(C) 2013 Leandro Lourenço Dumas. This is an open access article distributed under the terms of the Creative Commons Attribution License 3.0 (CC-BY), which permits unrestricted use, distribution, and reproduction in any medium, provided the original author and source are credited. Alterosa Blahnik, 2005 contains 35 described species distributed in southern and southeastern Brazil. Three new species of Alterosa from northeastern Brazil are described and illustrated, Alterosa amadoi sp. n., Alterosa castroalvesi sp. n. and Alterosa caymmii sp. n., the first records of the genus from northeastern Brazil. An identification key for all known species of the genus is also presented. Philopotamidae are distributed throughout the world with 1, 194 described species in 19 extant genera (Holzenthal et al. 2011). The family contains 3 subfamilies: Rossodinae, with the monotypic genus Rossodes Özdikmen & Darilmaz, 2008 limited to Madagascar, originally described as Paulianodes by Ross (1956); Chimarrinae, with nearly 600 species mainly in the cosmopolitan genus Chimarra Stephens, 1829; and the also cosmopolitan subfamily Philopotaminae, with more than 400 species (Blahnik 2004, 2005). The subfamily Philopotaminae contains 16 genera, most of relatively restricted distribution (Holzenthal et al. 2007). Only 3 genera of Philopotaminae are recorded from the Neotropics: Sortosa Navás, 1918, Wormaldia McLachlan, 1865, and Alterosa Blahnik, 2005 (Blahnik 2005). The genus Alterosa was originally described by Blahnik (2005) to include 2 previously described species, Dolophilodes (Sortosa) sanctipauli Flint, 1971 and Dolophilodes (Sortosa) marinonii Almeida & Duarte, 2003, and 20 new species, totaling 22 species. More recently, 13 new species were described by Jardim and Dumas (2012) and Dumas and Nessimian (2013), raising the total to 35 species distributed exclusively in south and southeastern Brazil. These species are usually found in pristine headwaters and rapids of streams or small rivers in the Atlantic Forest; they are rarely encountered near large rivers. Despite the recent increase in the number of species known from the country, the Brazilian diversity of Alterosa seems to be greatly underestimated, with many more unknown species remaining to be collected. Additionally, there is a lack of knowledge of most aspects of the biology, ecology and distribution of the species, including their immature stages, which are unknown. In this paper we provide descriptions, diagnoses and illustrations of 3 new species of Alterosa from Bahia state, the first records from northeastern Brazil. In addition, we provide an identification key for all known species of the genus. The specimens were collected with UV light pan traps (Calor and Mariano 2012) and preserved in 70% ethanol. In order to observe the genital structures, the abdomen of each specimen was removed and cleared in a heated lactic acid 85% solution, followed by a rinse in distilled water, transferred to a solution of 95% EtOH, and mounted temporarily in glycerin or glycerin jelly on a slide for viewing and drawing (Blahnik et al. 2007). After that, removed abdomens were transferred back to alcohol and stored permanently in micro vials with 80% EtOH. A Zeiss stereomicroscope and a Zeiss optical microscope, each equipped with a camera lucida, were used to observe specimens. Genitaia were drawn in pencil and drawings were inked with a technical pen and light table. Females were not illustrated because the minor differences among them were not diagnostic. The terminology used in the descriptions follows that of Blahnik (2005). The type specimens and additional material were deposited in Coleção Entomológica Professor José Alfredo Pinheiro Dutra, Departamento de Zoologia, Universidade Federal do Rio de Janeiro, Rio de Janeiro state, Brazil (DZRJ), Museu de Zoologia da Bahia, Universidade Federal da Bahia, Bahia state, Brazil (UFBA), and Museu de Zoologia, Universidade de São Paulo, São Paulo state, Brazil (MZSP). Alterosa amadoi sp. n. cannot be easily placed in any of the species groups defined by Blahnik (2005). Alterosa amadoi sp. n. and Alterosa caymmii sp. n. share character similarities with Alterosa ruschii Dumas & Nessimian, 2013 and Alterosa spiesae Dumas & Nessimian, 2013, regarding the general structure of the branched intermediate appendages. However, unlike Alterosa ruschii and Alterosa spiesae, the 2 new species cannot be placed in or even near the Alterosa sanctipauli group because of the lack of a basal rounded protuberance on tergum X, with cuticle scabrously developed, and the absence of a crest-like process at the apex of tergum X. Alterosa amadoi sp. n. can be diagnosed by the overall shape of the intermediate appendages, especially the rod-like mesal branch with spines at its apex, and the inferior appendages with the 1st article short and nearly as wide as long. An additional diagnostically unique character for this new species is the dorsal spiny crest-like projection at midlength of tergum X. Adult. Color (in alcohol) brown; legs, palps, and antennae pale brown, forewing pattern not discernible. Male forewings 5.6–6.4 mm (n=3). Male genitalia. Tergum VIII with posteromesal margin moderately emarginate; emargination U-shaped and extending no more than halfway to anterior margin. Sternum IX with anterolateral margin weakly rounded, subtruncate; posteroventral margin greatly produced, extending nearly linearly from dorsum (Fig. 1A). Tergum IX greatly reduced, membranous or fused to base of tergum X (Fig. 1B). Tergum X tapered from base in lateral view; dorsally with spiny crest-like projection at midlength; apex sensillate, subtruncate, slightly enlarged in lateral view (Figs 1A, 1B). Intermediate appendages heavily sclerotized, branched subbasally; mesal branch elongate, surpassing preanal appendages, rod-like, blunt and with small spines apically; lateral branch lobe-like, rounded, covered by spine-like setae, subacute apically in dorsal view, apex greatly enlarged and rounded as viewed laterally (Figs 1A, 1B). Preanal appendages elongate, club-like, covered with stiff, small setae; apex rounded with elongate subacuminate projection bearing small apical setae as viewed laterally and dorsally (Figs 1A, 1B). Inferior appendages robust, setose; 1st article, in lateral view, short, nearly as wide as long, bulging mesally; 2nd article longer than 1st article, relatively wide, base as wide as apex of 1st article, slightly enlarged apically and with small pad of short, stiff apicomesal setae (Figs 1A, 1C). Phallobase tubular, relatively short, slightly curved; endotheca without spines; phallotremal sclerites indistinct (Fig. 1D). Alterosa amadoi, new species, male genitalia. A left lateral view B dorsal view (setae of left lateral branch of intermediate appendages omitted) C left inferior appendage, dorsal view D phallic apparatus, left lateral view. Abbreviations: inf. app. – inferior appendage; int. app. – intermediate appendage; pr. app. – preanal appendage; ter. X – tergum X; IX - tergum IX. Holotype male: BRAZIL: Bahia: Camacan, RPPN Serra Bonita, riacho 1, trilha nova, 15°23'35"S, 39°33'50"W, ca 770 m, bandeja, 1.iv.2011, F. Quinteiro, D. França & H. Barreto leg. (MZSP). Paratypes: BRAZIL: Bahia: Camacan, RPPN Serra Bonita, riacho 1, trilha nova, 15°23'35"S, 39°33'50"W, ca 770 m, bandeja, 30.iii.2011, F. Quinteiro, D. França & H. Barreto leg., 1 male (DZRJ 3791); Camacan, RPPN Serra Bonita, 2ª cachoeira, over night, 03.xi.2009, A. R. Calor leg., 1 male (UFBA). The species is dedicated to the deceased Brazilian writer Jorge Amado, who was born in Bahia state in 1912 and died in 2001. Amado is one of the most acclaimed contemporary Brazilian novelists, whose 32 novels have sold millions of copies. Among his best-known works are “Capitães de Areia”, “Gabriela, Cravo e Canela”, and “Tieta do Agreste”. In 2012, Brazil celebrated the centenary of his birth. Alterosa castroalvesi sp. 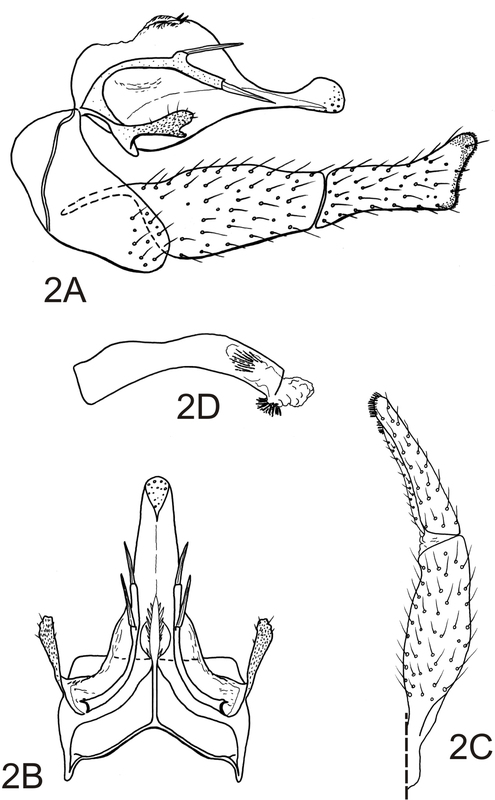 n. is closely related to Alterosa truncata Blahnik, 2005, resembling that species in the broadened and truncate apices of the inferior appendages, the elongate, narrow, and arched intermediate appendages, each terminating in a very prominent apical lance-like seta, and the general structure of preanal appendages. Additionally, the general structure of tergum X with paired longitudinal, serrate ridges, is also similar between these species. It differs in that the intermediate appendages in Alterosa castroalvesi sp. n. have 2 prominent lance-like setae, the usual apical 1 and an additional 1 at the apical third. Alterosa castroalvesi sp. n. also differs from Alterosa truncata in the length of 2nd article of preanal appendages, that is relatively shorter in the new species. The differences are relatively minor and it is possible that the 2 species may eventually prove to be not specifically distinct. As Alterosa truncata, the new species probably belongs to Alterosa sanctipauli Group, as defined by Blahnik (2005). Adult. Color (in alcohol) brown; legs, palps, and antennae pale brown, forewing pattern not discernible. Male forewings 6.0–6.8 mm (n=4). Male genitalia. Tergum VIII with posteromesal margin deeply emarginate, emargination V-shaped and extending more than half way to anterior margin. Sternum IX with anterolateral margins broadly rounded; posteroventral margin greatly produced, forming broadly rounded expansion (Fig. 2A). Tergum IX greatly reduced, membranous or fused to base of tergum X (Fig. 2B). Tergum X narrow, wider at base, lateral margins subparallel in dorsal view; dorsally with mesally divided crest-like projection near base, with spine-like projections along each side of divided margin; apex sensillate, rounded as viewed dorsally, rounded and slightly enlarged in lateral view (Figs 2A, 2B). Intermediate appendages heavily sclerotized, elongate, extending past preanal appendages, rod-like, curved at base, narrowly paralleling lateral margins of tergum X; intermediate appendages with small projection at apical third bearing 1 apical lance-like seta; apex acute, terminating in apical lance-like seta (Figs 2A, 2B). Preanal appendages narrow, constricted basally, moderately elongate, not greatly modified, covered with scant setae and numerous minute spine-like setae; apex rounded, without apical setae, with 1 short preapical projection from the ventral surface, fringed apically with minute spines (Figs 2A, 2B). Inferior appendages elongate, linear, flattened on mesal surface, setose; each with 1st article, in lateral view, approximately 2 times as long as wide, tapering apically; 2nd article slightly shorter than 1st article, moderately wide, nearly as wide at base as apex of 1st article, apex enlarged and subtruncate, with fringing pad of short, stiff apicomesal setae (Figs 2A, 2C). Phallobase tubular, narrow, moderately elongate, with slightly curvature; endotheca with 2 tracts of fine spines, 1 of needle-like spines and 1 ventral of shorter spines (Fig. 2D). Alterosa castroalvesi, new species, male genitalia. A left lateral view B dorsal view C left inferior appendage, dorsal view D phallic apparatus, left lateral view. Holotype male: BRAZIL: Bahia: Camacan, Serra Bonita, Córrego das Torres, 15°23'01"S, 39°34'19"W, ca 860 m, 02.viii.2008, A. R. Calor, L. Lecci, L. C. Pinho & A. Moretto leg. (MZSP). Paratypes: BRAZIL: Bahia: same data as holotype, 2 males (DZRJ 3797), 1 male (UFBA). This species is named in memory of Antônio Frederico de Castro Alves, known as “the poet of the slaves” because of his sympathy for the Brazilian abolitionist cause. Castro Alves was born in Bahia state in 1847 and died at 1871. He is the patron of the 7th chair of the Brazilian Academy of Letters. Some of his abolitionist poems, like “Espumas Flutuantes”, “A Cachoeira de Paulo Afonso”, and “O Navio Negreiro”, were collected in a posthumous book called “Os Escravos”, published in 1883. Alterosa caymmii sp. n. is very similar to Alterosa amadoi sp. n., as discussed under that species. It differs in that the lateral branch of each intermediate appendage is apically projecting in Alterosa caymmii sp. n., while in Alterosa amadoi sp. n. it is broadly rounded. Alterosa caymmii sp. n. also differs from Alterosa amadoi sp. n. in the shape of inferior appendages. Additionally, the phallus of Alterosa caymmii sp. n. is more developed, with endotheca bearing several tracts of numerous large spines. Adult. Color (in alcohol) brown; legs, palps, and antennae pale brown, forewing pattern not discernible. Male forewings 5.2–6.4 mm (n=10). Male genitalia. Tergum VIII with posteromesal margin not or scarcely emarginate. Sternum IX with anterolateral margins weakly rounded, subtruncate; posteroventral margin greatly produced, forming broadly rounded expansion (Fig. 3A). Tergum IX greatly reduced, membranous or fused to base of tergum X (Fig. 3B). Tergum X tapered from base in lateral view; apex sensillate, rounded as viewed dorsally, subtruncate and slightly enlarged in lateral view (Figs 3A, 3B). Intermediate appendages heavily sclerotized, branched subbasally; mesal branch moderately elongate, surpassing preanal appendages, slightly curved outward at midlength in dorsal view, rod-like, rounded apically, covered with spine-like setae; lateral branch short, flange-like, covered with spine-like setae in apical half, apex enlarged and rounded in lateral and dorsal views (Figs 3A, 3B). Preanal appendages elongate, club-like, covered with stiff, small setae; apex rounded with small subacuminate projection bearing small apical setae as viewed laterally and dorsally (Figs 3A, 3B). Inferior appendages elongate, linear, flattened on mesal surface, setose; each with 1st article, in lateral view, approximately 2 times as long as wide, tapering apically; 2nd article subequal in length to 1st article, relatively narrow, especially at midlength, apex rounded, with prominent pad of short, stiff apicomesal setae (Figs 3A, 3C). Phallobase tubular, very short, scarcely curved; endotheca elongate, with several tracts; 1 paired tract near base without spines, 1 apicolateral tract with several large spines, and 1 single tract at apex with 2 clusters of small spines; phallotremal sclerites indistinct (Figs 3D, 3E, 3F). Alterosa caymmii, new species, male genitalia. 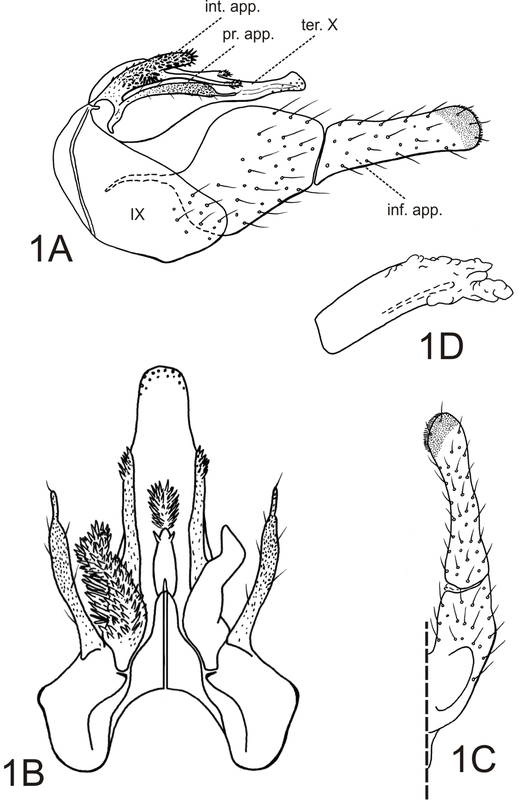 A left lateral view B dorsal view C left inferior appendage, dorsal view (setae of left lateral branch of intermediate appendages omitted) D phallic apparatus, left lateral view E phallic apparatus, dorsal view; 3F, phallic apparatus, ventral view. Holotype male: BRAZIL: Bahia: Varzedo, Serra da Jibóia, Reserva Jequitibá, 12°52'21.5"S, 39°28'56.5"W, 07.xi.2010, ca 400 m, A. M. Silva-Neto & M. Araújo leg. (MZSP). Paratypes: BRAZIL: Bahia: same data as holotype, 7 males, 3 females (UFBA); Varzedo, Reserva Gambá, 12°57'12"S, 39°28'32"W, ca 510 m, 08.xi.2010, bandeja, A. R. Calor, F. Quinteiro, D. França, R. Mariano & A. Costa leg., 17 males, 1 female (UFBA); Santa Teresinha, Serra da Jibóia, Riacho das Torres, 12°50'59"S, 39°28'47"W, ca 490 m, 06.x.2010, Luz, A. R. Calor, F. Quinteiro, D. França, R. Mariano & A. Costa leg., 37 males, 16 females (DZRJ 3792); Santa Teresinha, Distrito de Pedra Branca, Riacho das Torres, 12°51'00"S, 39°28'48"W, ca 490 m, 28.ix.2009, Luz, A. R. Calor & A; Cruz leg., 1 male (UFBA); Santa Teresinha, Distrito de Pedra Branca, Riacho das Torres, 12°51'00"S, 39°28'48"W, ca 490 m, 10.vi.2010, Luz, A. R. Calor, D. França & F. B. Quinteiro leg., 1 male (UFBA); Santa Teresinha, Distrito de Pedra Branca, Riacho das Torres, 12°51'01"S, 39°28'48"W, ca 500 m, 07.viii.2009, A. R. Calor & L. Lecci leg., 1 male (UFBA); Varzedo, Serra da Jibóia, Fazenda Baixa da Areia Cai Camarão, 12°57'45"S, 39°27'12"W, ca 260 m, 27.iii.2012, Pan light trap, F. B. Quinteiro, T. Duarte & I. Garcia leg., 2 males (UFBA); Camacan, Serra Bonita, córrego 1, 15°23'28"S, 39°33'56"W, ca 820 m, 31.vii.2008, Luz UV e branca, A. R. Calor, L. Lecci, L. C. Pinho & R. Moretto leg., 2 males, 1 female (DZRJ 3793); Camacan, Serra Bonita, 1ª cachoeira, 15°23'28"S, 39°33'57"W, ca 830 m, 04.xi.2009, A. R. Calor et al. leg., 2 males (UFBA); Camacan, Fazenda Waldemar da farmácia, 15°25'17"S, 39°34'01"W, ca 310 m, 28.iii.2011, A. R. Calor, F. Quintero, D. França & H. Barreto leg., 1 male (DZRJ 3794); Camacan, RPPN Serra Bonita, riacho 1, 15°23'40"S, 39°33'44"W, ca 720 m, 31.iii.2011, F. Quinteiro, D. França & H. Barreto leg., 2 males (UFBA); Camacan, RPPN Serra Bonita, Malaise 1, 15°23'28"S, 39°33'56"W, ca 260 m, iv.2011, A. R. Calor leg., 5 males, 2 females (DZRJ 3795); Wenceslau Guimarães, Estação Ecológica Estadual Wenceslau Guimarães, Riacho Serra Grande, cachoeira em cima, 13°35'43"S, 39°43'12"W, ca 580 m, 10.x.2010, A. R. Calor et al. leg., 2 males, 2 females (UFBA); Wenceslau Guimarães, Estação Ecológica Estadual Wenceslau Guimarães, Rio Patioba, 13°34'50"S, 39°42'17"W, ca 540 m, 09.x.2010, A. R. Calor et al. leg., 1 male (DZRJ 3796); Amargosa, Serra do Timbó, Fazenda Timbó, Córrego Santa Rita, 13°06'22"S, 39°39'59"W, ca. 710 m, 17.vii.2009, A. R. Calor & L. Lecci leg., 1 male (UFBA). This species is named in memory of Dorival Caymmi, considered one of the most important Brazilian songwriters. Caymmi was born in Bahia state in 1914 and died at 2008. He became a national icon with his lyrics that evoked the charm of Bahia’s fishing villages, beaches and beautiful women, like “O Que é Que a Baiana Tem?”, “Marina”, “Rainha do Mar”, “Samba da Minha Terra”, among others. – Intermediate appendages with 2 lance-like setae, 1 at apical third and 1 at apex; inferior appendages with 2nd article slightly shorter than 1st article (Figs 2A, 2B) Alterosa castroalvesi sp. n.
36 Tergum X dorsally with spiny crest-like projection at midlength; intermediate appendages with lateral branch lobe-like; inferior appendages with 1st article short, nearly as wide as long; endotheca of phallus without prominent spines (Figs 1A, 1B, 1D) Alterosa amadoi sp. 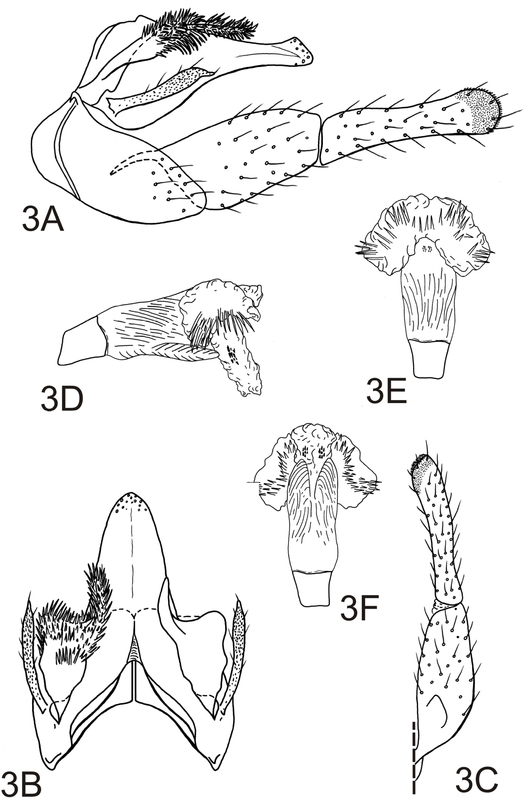 n.
– Tergum X without crest-like projection; intermediate appendages with lateral branch flange-like; inferior appendages with 1st article approximately 2 times as long as wide; endotheca of phallus with several paired tracts bearing prominent spines (Figs 3A, 3B, 3D, 3E, 3F) Alterosa caymmii sp. n.
We thank the Laboratório de Entomologia Aquática (LEAq, UFBA) team for field assistance. We especially thank Anne Costa for her important assistance in the laboratory. L. L. Dumas was supported by CNPq (Conselho Nacional de Desenvolvimento Científico e Tecnológico). A. R. Calor was supported by CNPQ, FAPESB and PPBio Semi-árido. J.L. Nessimian is a fellowship holder (researcher) of CNPq. Blahnik RJ (2004) New species of Chimarrhodella from Venezuela and Ecuador (Trichoptera: Philopotamidae). Zootaxa 552: 1-7. Blahnik RJ (2005) Alterosa, a new caddisfly genus from Brazil (Trichoptera: Philopotamidae). Zootaxa 991: 1-60. Blahnik RJ, Holzenthal RW, Prather A (2007) The lactic acid method for clearing Trichoptera genitalia. In: Bueno-Soria J, Barba-Alvarez R, Armitage B (Eds). Proceedings of the XIIth International Symposium on Trichoptera. The Caddis Press, Columbus, Ohio: 9-14. Calor AR, Mariano R (2012) UV light pan traps for collecting aquatic insects. Entomobrasilis 5: 164-166. Dumas LL, Nessimian JL (2013) New species of the caddisfly genus Alterosa Blahnik 2005 (Trichoptera: Philopotamidae: Philopotaminae) from Brazil. Zootaxa 3609: 26-48. Holzenthal RW, Blahnik RJ, Prather AL, Kjer KM (2007) Order Trichoptera Kirby, 1813 (Insecta), Caddisflies. In: Zhang ZQ, Shear WA (Eds). Linnaeus Tercentenary: Progress in Invertebrate Taxonomy. Zootaxa 1668: 639–698. Holzenthal RW, Morse JC, Kjer KM (2011) Order Trichoptera Kirby, 1813. In: Zhang ZQ (Ed). Animal biodiversity: An outline of higher-level classification and survey of taxonomic richness. Zootaxa 3148: 209–211. Jardim GA, Dumas LL (2012) A new species of the genus Alterosa (Trichoptera: Philopotaminae) from southeastern Brazil. Revísta de Biologia Tropical 60: 577-580. Ross HH (1956) Evolution and Classification of the Mountain Caddisflies. University of Illinois Press, Urbana, 213 pp.